Detroit Congresswomen Brenda Lawrence and Rashida Tlaib are calling for stronger oversight of the city's demolition program following reports that contractors used contaminated dirt and buried houses with asbestos-containing materials. [Lawrence and Tlaib] on Thursday formally sent a request to the Michigan Department of Environmental Quality and the Michigan State Housing Development Authority, according to letters obtained by the Free Press. A spokeswoman said the letter also will be sent to Gov. Gretchen Whitmer and Detroit Mayor Mike Duggan. The pair urged both state agencies to fully implement recommendations made in 2017 by the federal Special Inspector General for the Troubled Asset Relief Program and Army Corps of Engineers to address issues associated with blight remediation programs across southeastern Michigan. It was unclear why those recommendations have not been enacted already. “With over 11,000 homes demolished in Wayne County, we are requesting MDEQ and MSHDA to take a deeper look into the Blight Elimination Program, as well as provide an update on the plan of action regarding oversight of this issue,” Lawrence said in a statement, adding that she was "deeply" concerned. 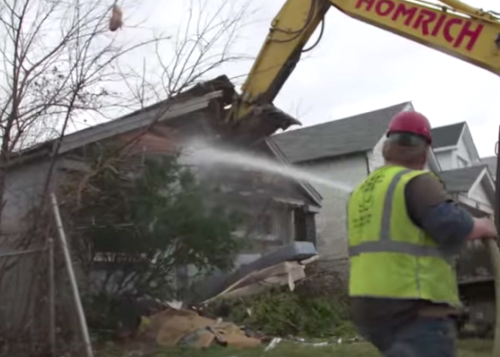 Much of the funding for Detroit's demolition program comes from the federal government. Brian Farkas, Director of Special Projects for the Detroit Building Authority said in a statement to the Freep that "public health and safety have been our top priorities since the earliest days of the city’s demolition program." Farkas said Detroit’s demolition team has worked closely with SIGTARP and the City’s Inspector General on the investigation. "We welcome the opportunity to address concerns expressed by Rep. Lawrence and Rep. Tlaib," Farkas said. "We will be reaching out to their offices in the near future to set up a tour of the demolition program to help them better understand our thorough environmental safety measures."